Reinforce the GUESS? brand by building a venue for creative events, fashion shows and company meetings. 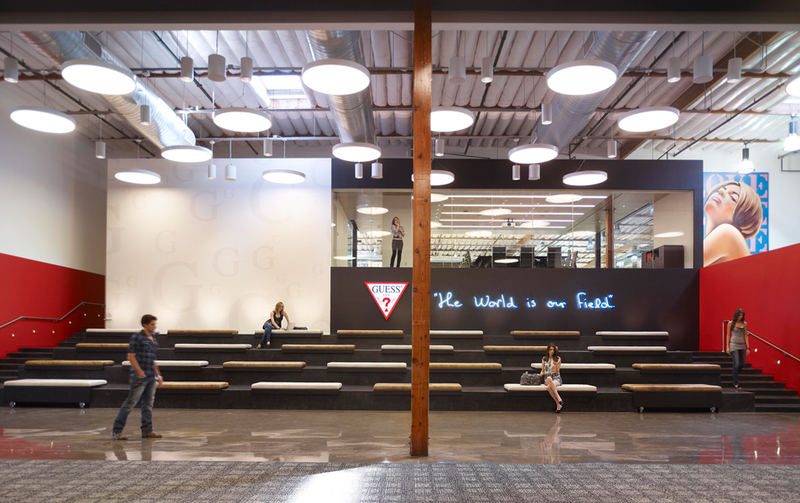 An existing warehouse was transformed into free-flowing public areas, conference rooms and offices. Modifying the structure created a column-free space which seats 800 people. Moving panels and motorized drapes allow the meeting and dining areas to be divided, for visual privacy and a more intimate feel. The riser and equipment storage room doubles as a dressing room. This area also contains dimming controls for theater lighting, designed to support special events. Audio and video signals may be routed throughout the building to dining rooms, offices, and the VIP conference room. Permanent audio and video equipment includes professional quality loudspeakers and a large venue digital cinema projector, as well as voice reinforcement, control, and video source systems. A comprehensive high definition signal routing system allows rental equipment to complement fixed equipment, with minimum set up time. Key Element: A former warehouse reimagined as a showpiece for one of the biggest clothing brands in the world.